Comment: this project could readily be named Retardede Musik, for instance, because it chimes like it would have been produced by a stoned producer. In fact, it was German expression to depict the fight Hitler and his silly company exerted against the so-called degenerate music. It is sample-based, it is inconsistent, it is mad, it is cut-up into a thousands of pieces. More concretely, these samples come out of very different sources ranging from tumultuous metal riff oriented torrents and smooth classical compositions to spoken word samples, organic street noises and fragile flamenco guitar chords to electronic sonic effects. It sounds like a reflection of human people`s world where things used to change permanently in the direction to the future or having no physical and temporal entry toward the past (read: chance to go back to his/her youngster days). 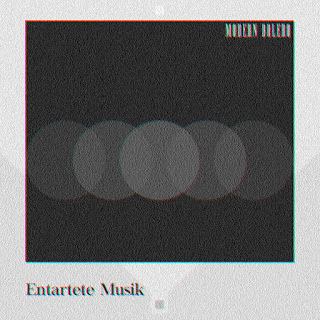 On the other side, the title track Modern Bolero reflects upon the contrary tendency – it consists of permanent ringing of the table phone being open to minimal changes and iterative sonic samples. In a word, it provides intriguing listening thrills for sure. This was the artist`s first issue to release four further albums later during four years. The album comes out of Yogyakarta, Indonesia.